A lot of people have a lot of confusion about decarboxylation. Yet this is an essential step if you ever hope to make potent marijuana edibles. Even though it’s a big scientific word, the process sounds simple enough. Heat the cannabis or cannabis concentrate in order to cause the chemical reaction that converts non-psychoactive THC-A into psychoactive THC. But heat for how long? And at what temperature? There is massive disagreement among the lexicon of cannabis information out there. Of course people have been successfully making edibles without a decarbing gadget for centuries, but do it wrong and you may have medicinal edibles that lack the high most people are seeking. And I get a lot of emails from a lot of home cook having just this problem. Shanel Lindsay, inventor of the Ardent Decarboxylator put in the research and found a way to achieve 100% decarboxylation. Of course this is proprietary company information, but Ardent has lab tests to show their decarboxylator actually converts 100% of the THC-A in cannabis to THC. 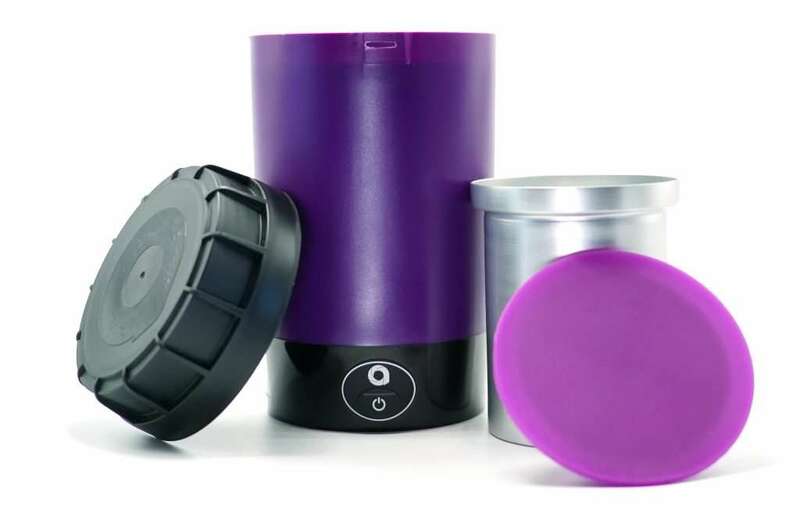 About the size of a portable coffee grinder, the Ardent Decarboxylator takes away all the guesswork of decarbing cannabis. 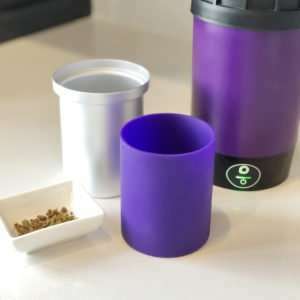 Place plant material or hash, kief, or hash oils (in a silicon container for the latter) in, place the inner and outer lids on, press a button, and in a little under 2 hours your cannabis will be perfectly, 100% decarboxylized. The product could not be easier or more convenient to use. If I had any critique — and my audience immediately echoed this the first time I posted an Instagram pic of the Ardent Decarboxylator — it’s size. It holds just under an ounce of cannabis. Now for the average home consumer who does not grow their own, this is fine, but those who do grow their own will probably want to decarb more volume at once. The folks at Ardent assure me this is something they are working on for the future. Size constrictions aside, this gadget is a workhorse! I put it to the test by decarbing in back-to-back small batches, about 2 1/2 pounds of cannabis (a grower friend gifted me with leftover trim). No problem. Besides increased potency, there is another advantage to knowing you have perfectly activated 100% of your THC and that’s dosing. For those who have taken my free online Edibles Dosing Class and use my edibles dosage calculator tool, proper marijuana decarboxylation is important in order to get accurate dosing estimates. If you fail to convert a majority of the THC-A to THC, your dosing estimates will be high and you may be disappointed in the potency of the finished edible. The Ardent Decarboxylator eliminates those discrepancies. Infusing in the Ardent Lift Decarboxylator! Decarb your cannabis flowers, kief, has, or hash oil in the Lift. Place butter or oil along with the proper amount of cannabis in a small glass jar or bottle (small enough to fit in the lift – glass baby food or yogurt jars work well). Alternately you can purchase a special silicone inner sleeve from Ardent (pictured above) that eliminates the need for a jar. Place the filled jar in the Lift but do not cover it, but do use both the purple silicone cover and black plastic cover that come with the Lift. Press the button and let it run through the cycle. When the light turns green your infusion is ready, use a small strainer, or miniature funnel with a pipe screen, to strain and you are done! Do I recommend the Ardent Decarboxylator? Yes. I have one, love it, and use it all the time. That said, with a price point of about $200.00, the casual user who makes a batch of marijuana brownies once or twice a year can probably live without it. But if you are serious about your edibles, if precise dosing matters to you, or if you are a caregiver preparing edibles as medical treatment, this gadget is a worthy investment. For more information about the Ardent Decarboxylator or to order, see this page. Thanks for the info on the Ardent decarb device. I received it yesterday and have my third batch in now . It’s obvious I have not been decarbing in the oven correctly since this is so much more potent ! I am ecstatic with this purchase even though the up front cost is expensive it will pay for itself in short order !! Thanks again Cheri for all you do. New from Ardent: Infusions Kits! If you know someone who owns an Ardent Lift, these make terrific gifts. The gourmet kits come with everything you need to infuse right in the Ardent, right down to tiny straining funnels and screens. 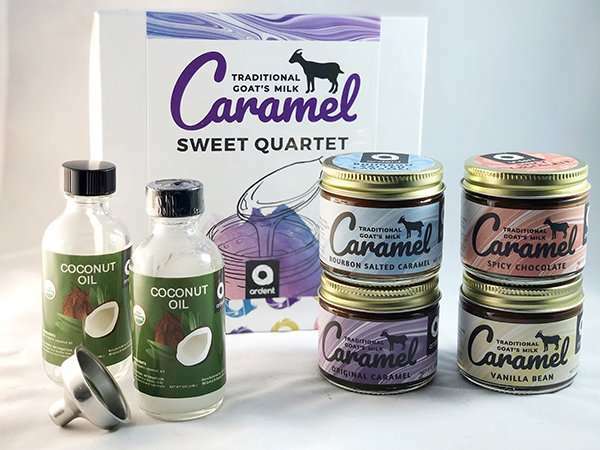 There are several kits to choose from including olive oil, coconut oil and yummy caramel! I ordered an Ardent NOVA and was sent an Ardent LIFT. I cant get a truthful answer from Ardent as to why…. The Nova and the Lift are the same product.